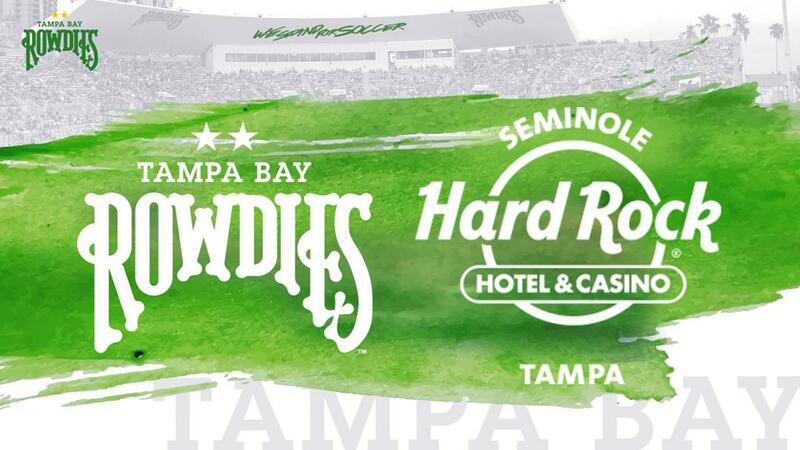 ST. PETERSBURG, Fla. (January 2, 2018) -- The Tampa Bay Rowdies announced today that for the fifth year in a row, the Seminole Hard Rock Hotel & Casino Tampa, the premier entertainment destination of Central Florida, has renewed its exclusive agreement as the club’s official jersey sponsor. The Seminole Hard Rock Tampa came on board in 2014 as the Rowdies’ jersey sponsor. Since then, the relationship has grown tremendously and will continue to grow into the 2018 season with an enhanced partnership comprised of the exclusive sponsorship agreement, which includes season tickets and services. The Seminole Hard Rock Tampa Retail Store will sell jerseys emblazoned with the Rowdies and Seminole Hard Rock logos. Jerseys and other gear can also be purchased at official team stores at Al Lang Stadium and the Sundial lifestyle center in downtown St. Petersburg and online at rowdiesgear.com. The Tampa Bay Rowdies kick-off their 2018 season in March. For additional information, or to order 2018 season tickets, call 727-222-2000, e-mail tickets@rowdiessoccer.com or click here. The Rowdies were the first professional sports franchise in Tampa Bay area and remain one of the most recognizable and well-loved brands in soccer. Originally established in 1975, the team won the NASL Soccer Bowl championship in its inaugural year and created a unique, entertaining and memorable franchise with the Fannies, the Loudies and Wowdies and unforgettable Kick in the Grass theme song. In 2008, a group of investors announced the purchase of rights to a professional soccer franchise and the newly established team began play in 2010. In December 2013, St. Petersburg businessman and philanthropist Bill Edwards acquired controlling interest of the club. In 2017 the Rowdies moved to the United Soccer League (USL) and broke 19 modern-era club records including most goals scored, most points, highest total and highest average attendance in a season. For more information visit www.rowdiessoccer.com, or follow on Facebook, Twitter and Instagram. Seminole Hard Rock Hotel & Casino Tampa is the premier entertainment destination of Central Florida. Owned and operated by the Seminole Tribe of Florida, the property is one of the most successful and largest casinos in the world. Located off I-4 at North Orient Road and Hillsborough Avenue, about 10 minutes east of downtown Tampa, the casino features high stakes table games, thousands of the hottest slot machines as well as a new smoke free slots area offering more than 850 popular games. Additionally, there is a new state-of-the-art Poker Room featuring 46 tables and a new art deco-inspired Mezzanine Level Casino with more than 500 premium and high limit slots. The hotel is AAA Four Diamond rated and offers six award-winning Zagat-rated restaurants, including the fine dining venue Council Oak Steaks & Seafood. The only place to rock one’s body and soul, Rock Spa® & Salon, is also available along with a plethora of VIP services. For more information, please call 866-502-PLAY or visit us online and via Facebook, Twitter, Instagram and Pinterest. ©2019 Tampa Bay Rowdies / SportsEngine. All Rights Reserved.